It’s that time again when the internet decides to throw away any semblance of accuracy or critical thinking and fAkE NeWs reigns supreme. Damn, that’s every day, isn’t it? Well, it’s April Fool’s Day again so we’ve put together a list of the best goofs, gags, bits, and japes from all your favourite techie brands. Technically you only have until midday to unleash your carefully crafted farce on the world. But seeing as the web is omnipresent, global, and doesn’t give a damn for time-honoured traditions, that no longer stands to be true. As such, you can expect a constant slew of ever more tiresome gags until way into the late hours and the calendar ticks over into the sweet respite of April 2, 2019. So without further ado, let’s get into this year’s gags: some funny, some not, and some simply attempts to generate clicks with outlandish and false information under the guise of ‘it’s just a prank, bro’. Did you hear Dota 3 will be an Epic Games Store exclusive? Nvidia teased this particular goof early when a ‘leaked’ image of this holographic AI-assistant first appeared on the web last week. Nvidia says that R.O.N will create 3D AR displays of maps and levels, convert your rage into supportive messages, and disprove trolls on the spot with its own Wolfram-Alpha style database of pertinent facts and figures. While Zotac is best known for its graphics cards and PCs the size of a set-top box, it’s now getting into the totally-adjacent electric vehicle game. 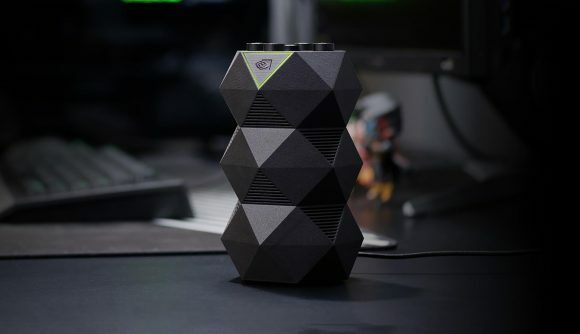 The company just announced the ultra-compact Zotac Gaming MEK Drive, a tiny electric vehicle kitted out with full, awe-inspiring, you guessed it, RGB lighting. The thing is with Razer recently announcing it was incorporating its own lighting software into electric vehicles in China – for reasons that its CEO, Min-Liang Tan, is still yet to confirm with us on Twitter – it’s not a huge leap to believe Zotac wants in on Elon Musk’s market. WCCFTech has been at it again with its own “leaked” information on Intel Xe. Claiming to have all the goss from an event put on by Intel called “Xe Unleashed”, the outlet suggests that a totally scalable, seamless dual-GPU design featuring 32GB of 4D XPoint, built on the 7nm process node, and capable of some 66.8 TFLOPs compute will launch on June 31st, 2020. A quick glance at the Gregorian calendar and you’ll notice that June 31st doesn’t exist, and nor does 4D XPoint memory. Although with SK Hynix recently announcing its own ‘4D’ memory, which is little more than marketing spiel and doesn’t actually wield the power of time itself, it’s not totally out of the realms of possibility for Intel’s own marketing team to adopt the name. But am I seriously meant to believe that Intel will have 7nm ready to roll by the start of 2020? Come on gang, these goofs have to be at least somewhat realistic. When it’s not working on annoying the EU or building controversial systems for the military, Google is hard at work talking to plants. Yes, Google Tulip is a system incorporated into Google Assistant that will help you tend to your favourite flower by understanding its wants, needs, and desires. Available only on April 1st. Razer has solved human interaction with its latest app, Razer Ping! This “contextual notification app” will report whatever it sees to your friends so you don’t have to. Productivity is up 1337% in Razer’s HQ thanks to the app, and it has been instrumental in solving that perennial issue of figuring out where to go for lunch in a group of three or more people. Oh and it created its own cryptocurrency mining system, Softminer, powered by Razer silver… that was real? Eesh. You know what gamers love? Shiny lights. So Newegg put a bunch directly onto the heat spreader of its own, in-house CPU. How did it get an x86 license necessary to build such a thing? Don’t worry about that. The point is it looks f-ing sweet and users are already reporting the iBrite is “opulent”, “eye-meltingly shiny”, and “a real fire hazard”. 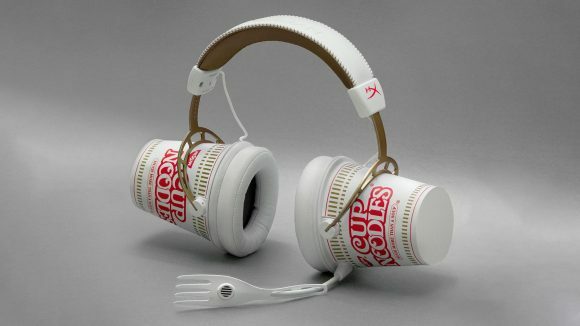 You’ve heard the best gaming cans, now get the best gaming cups. Gaming headset extraordinaire HyperX has teamed up with cup noodle royalty Nissin to create the Cup Noodle headphones, complete with microphork – a microphone shaped like a fork.